You may think a local uniform store is a must-have. But is that really the case? Consider the benefits of partnering with a premier uniform supplier partner like ServiceWear Apparel. 1. One on one service can happen anywhere. Not using a uniform store does not mean losing personalized service. Our Account Managers develop close working relationships with each department representative at your agency. Together, they determine which products to use and ensure your departments have all of the support to reduce costs and create a top notch uniform program. The goals are customer satisfaction and simplicity. 2. You can’t afford to wait 30 to 45 days for uniforms. The average uniform store has about 3,000 garments in stock, and only three to six employees customizing garments. Typically, orders for out-of-stock garments are placed once a week and received in another 2 to 3 weeks. You’re looking at an average of 30 to 45 days to receive your order, or sometimes even longer. In contrast, the U.S. Communities contract through ServiceWear Apparel is supported by over 15 million garments in stock every day, and over 300 employees dedicated to customization. Historically, 89% of all purchase orders are in stock and available for at once shipment. Orders are placed for out-of-stock garments every day. The average turnaround time for all orders is under 14 days. 3. Sending employees to a uniform store wastes time and money. The average number of hours a government employee spends using a local store is 2.5 to 3 hours per year. In most cases, the uniform store is only open during the day and the employees must leave work. If you have 500 employees that take 2.5 hours away from work to go to a uniform store, that’s 1,250 working hours lost. At an average hourly wage of $15, the total cost would be $18,750 per year. The total cost for three years is over $56,000. ServiceWear Apparel’s solution is a fit set. 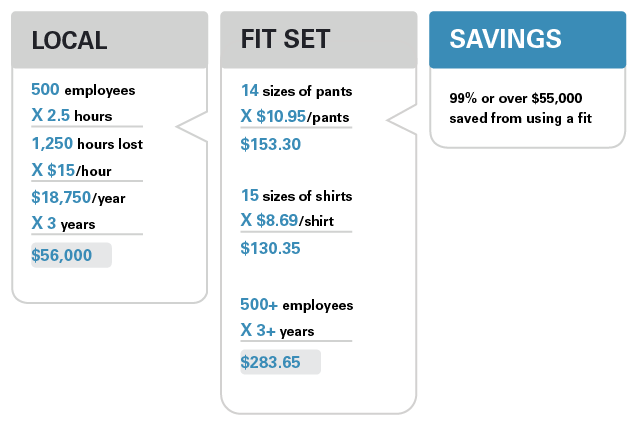 Fit sets are a range of sizes of the actual uniform pants and shirts an agency uses purchased and kept by your agency. The cost savings are significant. For example, 14 sizes of unhemmed work pants are $10.95, totaling $153.30. 15 sizes of long sleeve work shirts are $8.69, totaling $130.35. The total cost for a complete fit set for these type of garments is approximately $283.65. This is a one-time cost. Learn more about fit sets here. 4. Overall selection is greater. The average uniform store has a limited selection of uniform garments. ServiceWear Apparel offers over 70,000 styles, sizes and colors of uniform garments through the U.S. Communities uniform contract. 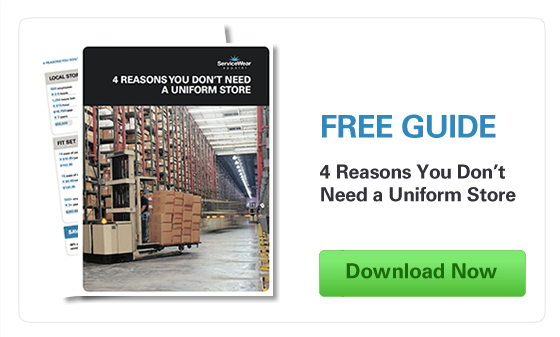 Download our free guide for a closer look at why you don’t need a uniform store. Partner with ServiceWear Apparel for stronger customer service, no bid processes, better selection, faster order times and much more.